There was no February fitness lapse for our adidas team last week as we launched the UltraBOOST X trainer, made specifically for the female foot, at the new adidas Women’s studio on Brick Lane. Running (literally) not one but three events across the day, the team were active from dawn until dusk. Starting with an 7am media launch session, journalists got the chance to hear about the unique design of the new shoe from Becky Gough on the adidas concept to consumer team. What is the point of hearing about the UltraBOOST X, however, if you can’t then try it? Kitting them all out in the latest shoe we gave everyone a morning to remember courtesy of a warm-up session with British Olympic bronze medallist Desiree Henry, followed by a unique adidas Runner’s session around the Brick Lane area. 13 brave members of the media braced the early start including Fabulous, Women’s Health, Evening Standard and The Sun. The pace didn’t slow down into the afternoon as double Olympic medallist, Jess Ennis-Hill, popped in to chat about the shoe and her own training regime post retirement with Women’s Health and the Evening Standard. 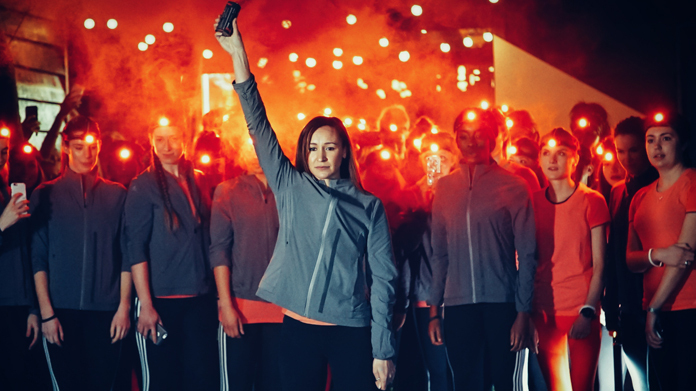 The day ended with a social media launch event from 6pm, with 16 of the most influential female fitness bloggers in attendance to hear more on the shoe, meet Jess Ennis-Hill, partake in an incredible night-time run and experience a workout at the studio. So far the launch has led to over 120 posts on social media from the likes of Twice the Health, Carly Rowena, Lottie Murphy and Emilie Lovaine and traditional media coverage including this video piece on the Evening Standard online. To pop down to the new adidas Women’s studio to take part in a free class and experience the UltraBOOST X yourself visit the Studio.